May 5, 12, 19, 26....and weekly until the migration is completed! Although Journey North is now completed for the school year, we're not going away. We will continue to collect your monarch sightings daily. Watch for a final migration map in mid-July. Here are 26 new sightings for your migration map. Reminder: Even if other people from your region have already reported monarchs, YOUR SIGHTING IS STILL IMPORTANT. The number of sightings we receive are a good indicator of monarch abundance. Thank you for your help! Monarchs continue to flood into the north, with butterflies now as far as 52N (Saskatchewan) and 47N (Minnesota). You'll find 38 new sightings today for your migration map. The migration flooded northward over the past week, with butterflies now as far as 46N and 47N. Of this week's 41 sightings, 12 were reported on a single day. Can you identify a weather system--or other factors--that may have led to the large number of sightings that day? As you watch for monarchs, they're watching too-- predators and parasites are on the prowl. Monarchs of the 1st spring generation are now appearing in full force: In the past week, 25 fresh, new monarchs have been reported from 17 states--and the 1st sightings also arrived from Canada. How far did the monarchs from Mexico go--and where are their offspring now being seen? As you map today's data, you may want to distinguish between the 2 generations. Today's monarchs sightings come from a surprisingly broad geographic range. And although the migration continues to be slow, the next generation is now on the wing. From Oklahoma, "The Monarchs are on their way! They are coming through daily," Today's migration map almost seems to show 2 pathways--how do you interpret the pattern? Over the past week, monarchs have been reported from some surprising places! "I couldn't believe my eyes today when I saw my first MONARCH pass by," wrote Brian Dalzell from New Bruswick's Bay of Fundy. Yet sightings this spring are down almost 50% from last spring. Where have all the monarchs gone? Biologists share their ideas--and the many questions this question raises. This spring's first sighting was finally reported from Virginia! The report came a full 20 days later than last year's first sighting in that state. In Texas the old, faded monarchs are just about gone now, and the first spring generation is now in chrysalis and fifth instar stage. Why do monarchs disappear there during the summer months? How far north do the monarchs that wintered in Mexico go? This week's migration map is probably the answer for spring, 1998. Each year at this time, we expect a lull in sightings. Why do you think this is so? Other News: The symbolic monarchs have landed in the north. Thanks to UPS, their migration from Mexico took only 12 hours! The migration continues to advance, though slowly and quietly, with scattered reports now from as far north as Kansas, N.C. and Illinois. If the monarch population was at a peak last fall, and if the low numbers this spring indicate a smaller population, where have all the monarchs gone? Also see Answers from the Monarch Expert. Monarchs have now moved as far north and east as Georgia. They've laid millions of eggs along the trail, and the next generation of monarchs is now developing. If you live in the north, YOUR first monarch of the season will probably be the offspring of these Mexican migrants. The migration has now spread across Texas and into Louisiana, Oklahoma, Mississippi and Arkansas. Strong south winds last week, with gusts up to 35 mph, seem to have pushed them. The big question is, can they find milkweed that far north? Monarchs were pouring across the border in the Rio Grande Valley on the March 16th and 17th. They've crossed into Texas and are coming our way! As the migration from Mexico spreads northward, an unusual sighting from Florida was reported. What questions do you have for the observer? The monarchs are on their way! "Monarchs were pouring from the mountains and flooding though the town of Angangueo--all headed northward." reports Bill Calvert from Mexico. Three to 4 weeks of warm, dry, cloudless weather has stirred the over-wintering monarch butterflies up to a frenzy. One gets the impression of swarming--the migration is about to begin! As the time for the migration approaches, the butterfly colonies have begun to spread down the mountains. Mating activity has increased, since the lives of these monarchs will soon end. Why is it important to note the condition of the monarch's wings when we track their spring migration? 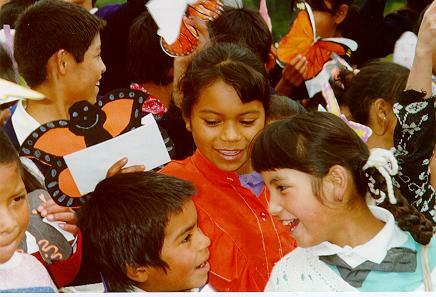 Dr. Calvert reports from the sanctuaries in Mexico; a bright sunny day and a sky filled with butterflies. Students share their ideas for conservation in the region. As a follow-up to last week's news about logging in the monarch over-wintering region, we take a closer look today at the lives of the people who live in this part of Mexico. Illegal logging has been reported in Mexico, with over 600 fir trees cut in the San Andreas wintering site and perhaps up to 4 million monarchs killed. Who should be responsible for protecting monarch habitat?